Ever since Electors elected Barack Obama President of the United States, many of those of you who are convinced he is Constitutionally ineligible for the job, unable to forestall his inauguration, alternatively determined to elect new public officials and enact new laws intending to forestall his election in 2012. I have rejected this response as taking a sort of ‘revolving door’ approach. That is, as I have reasoned many times, if we are impotent to get our current elected officials to enforce existing ballot eligibility laws then, we will not achieve a different outcome by electing new officials or writing new laws. 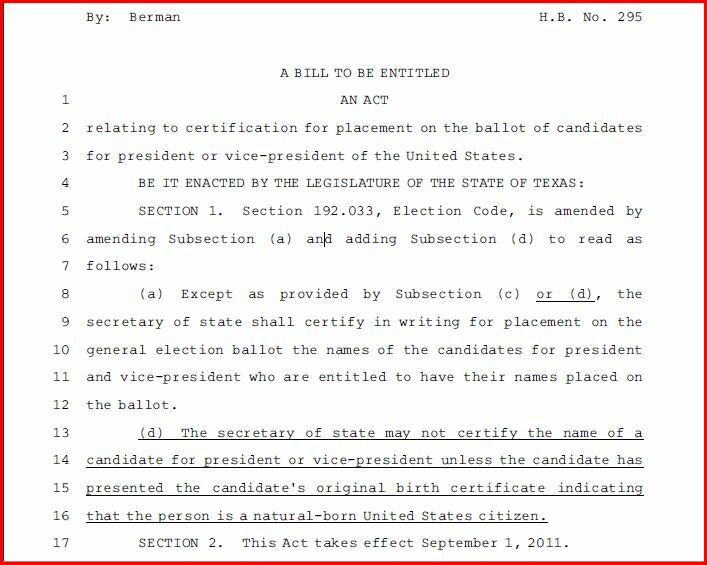 Now, the official conduct of Texas State Representative Leo Berman (R-Tyler) has necessitated a third description that could be applied to efforts to shore up our electoral process with respect to guaranteeing Presidential candidates are Constitutionally eligible for the job: just plain revolting. Yep; here’s the text of that bill. Right off the top, this wording presents many obstacles to fulfilling the function for which it is ostensibly written. For example, how can a birth certificate identify whether a person is a NBC? And then, there is this word, “entitled.” In the situation called to my attention in TX, wherein Bob Barr challenged the printing of the names of both the R and D nominees on the ballot, I pointed out, even if one is not entitled to something, this does not mean, one cannot get what he wants, anyway. Submitted on 2009/09/11 at 22:45 | In reply to juriggs. If you look at what I posted, I posted all the docs I received from the SoS with respect to the Certifications…5 docs. The Republicans actually used a “form” and I queried the SOS with respect to whether there was a specific “form” required and they responded “no”. The Deomcrats sent in two docs. One, the Official Certification, and the other more of a letter form. I believe the letter was in effect a cover sheet and as much as a form was not required, there was intent to comply with guidance from the State with respect to an “Official Certification”. I am also reading some stuff into this as both Parties missed the filing deadline. The pre-certification on my site from the republicans is I believe a way of showing thier “intent” to comply with the law which required Official Notification 70 days prior to the election. Again, just because a candidate is not entitled to be on the ballot does not prohibit the state from putting his name there anyway. To say nothing of the conflict between this proposed change to Texas Election Code 192.033; with 192.031, which section entitles party nominees qualified for office to appear on the ballot. http://law.onecle.com/texas/election/192.031.00.html And as we have already seen, in 2008, Boyd Richie, Chair of the Texas Democratic Party (“TDP”) swore Presidential nominee Obama was “duly nominated,” making him the qualified nominee. But here’s the biggest overall problem I have with Mr. Berman’s ‘efforts’ to shore up the integrity of the election process in Texas: Texas law already provides ample remedy to redress the fraud from 2008. As I have detailed in several articles and accompanying Comments, as well as the citizen complaint of election fraud against Boyd Richie, Chair of the TDP: current Texas state laws offer some of the strongest remedies to the election fraud related to candidate ballot eligibility, that tainted the 2008 election, from subjecting the TDP to the state’s Open Records law to subjecting Boyd Richie to Mandamus. Just for example, see JUDGE ABBOTT WOULD ORDER TDP CHAIR BOYD RICHIE TO DECLARE PRESIDENTIAL CANDIDATE BARACK OBAMA IS INELIGIBLE FOR THE JOB; CLOWNS to the LEFT of ME; JOKERS to the RIGHT (1 of 2); CLOWNS to the LEFT of ME; JOKERS to the RIGHT (2 of 2); OPEN LETTER to GREG ABBOTT, ATTORNEY GENERAL of TEXAS; A ROADMAP to ELECTION FRAUD in TEXAS in the 2008 PRESIDENTIAL (ELECTORS) ELECTION; TEXAS TWO-STEP; REMEMBER the ALAMO? ; and IDIOMS!. So, we have 3 approaches to fixing our electoral process so as to ensure the Constitutional eligibility of our Presidential nominee. Let’s compare and contrast their success. The revolving door policy has resulted in the election of several new state (and federal) officials. But none of them has publicly raised the issue of election fraud viz a viz ballot eligibility. Several hundred citizens from 6 (six) states have downloaded and filed my citizen complaints. But their conduct can hardly be characterized as revolutionary when, ignored by their A’sG, they have not publicly petitioned for a fair hearing on the steps of their state seats of government. Ha, I cannot even persuade citizens in all 50 states to examine their own laws so as to determine whether they are applicable states for my citizen complaints! Worse, azgo looked up laws in some other states and was able to identify AL and MO are applicable states – this information first appeared on this blog months ago now – yet no one from MO or AL has contacted me to get the ball rolling in either of those states! Then, there’s Mr. Berman’s flawed proposed legislation which, according to the article in Lubbock Online, likely won’t pass, anyway. These are bills that Berman has unsuccessfully filed in previous sessions. In the 2007 session, for example, then Rep. David Swinford, R-Dumas, chairman of the House State Affairs Committee, single-handedly killed all of Berman’s bills on the advice of Texas Attorney General Greg Abbott. Committee chairmen have the power to kill bills they consider harmful to the state. Swinford killed Berman’s bills because Abbott advised him that if the Legislature passed them, they would not survive court challenges and the state would spend millions of dollars on legal fees, like California did in the mid-1990s. Oh, and for your information, Representative Berman just became a member of the House Elections Committee! Given my extensive research into and knowledge of these issues in general and TX law in particular, perhaps citizens in Tyler, TX, the district represented by Mr. Berman, can suggest that if he is determined to propose new laws to address candidate eligibility, he should review the provisions in HOW to WRITE SMART CANDIDATE ELIGIBILITY LAWS in your STATE (and make applying to get on the ballot harder than applying to get into Harvard). Or, Tyler residents could ‘vote with their feet.’ Because besides being the simplest and quickest means to the eligibility end, I am still convinced, carried out as I envision, it will work. This entry was posted on Wednesday, February 23rd, 2011 at 01:11 and is filed under Uncategorized. You can follow any responses to this entry through the RSS 2.0 feed. You can leave a response, or trackback from your own site. Here is the Comment from Michelle, that started this all. jbjd-this is for our citizens of TX who I know filed complaints with TX A/G Greg Abbott/re: Boyd Richie, maybe they could make this man aware of what is going on and save the taxpayers of TX a lot of time and money. The bill was introduced by state Rep. Leo Berman, a Republican who doubts the citizenship of President Barack Obama, the Lubbock Avalanche-Journal reported Wednesday. In spite of his ambiguous language within his proposed bill, one has to at least give Texas State Representative Leo Berman (R-Tyler) some credit for having the courage to address the issue of eligibility. I do understand and appreciate your keen analysis, which only serves to prevent us from chasing our own tails so to speak. No sense in wasting even more time, especially with the 2012 presidential election looming just ahead. Shy of a concerned citizen conducting a self-imposed hunger strike outside the White House until Obama shared his original birth certificate in good-faith, Am wondering if we have hit an impassable road block. Seemingly, the gauntlet has been thrown down, and the powers to be are hoping this is a “Berlin Wall” that won’t be torn down. Forgive me for the rant, just wanted to have something tangible at this point so concerned Americans could turn the tide against the machine, and have this lingering question of eligibility resolved. Have a great week, jbjd. Back next week to lurk and learn some more.